Aside from the fact that 'nastalgia' and 'dinnett' are spelled wrong, i will venture to say that someone has been slicing away at the table. Probably it now has at least one straight edge, hence goes from "oval" to "round"
taken together these signs have a single message: this is a 'class' (not to be confused with crass)neighborhood. Ah, Newberry. There are easier ways of getting women there. I don't think this is the forum for that however. Aha, so this is what people did before there was Craigslist. 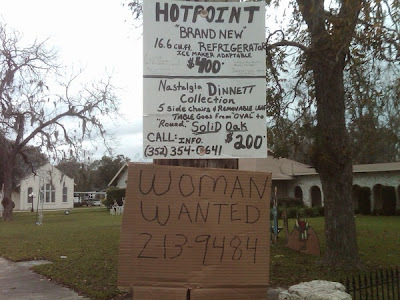 The "woman wanted" sign rather frightens me. Aye -- nothing is as scary on this post as the "woman wanted" sign. The real question: is that telephone pole in front of a church? It looks like there's a manger scene in the background. I think it means that the table has a removable "leaf" - mwaaaah ha ha!